Ancient Shipwreck Off Greek Island Yields A Different Sort Of Treasure : The Two-Way Divers exploring the famous Antikythera shipwreck, 200 feet beneath the water's surface in Greece, have turned up a heavy object they think might have been a powerful weapon in the first century B.C. 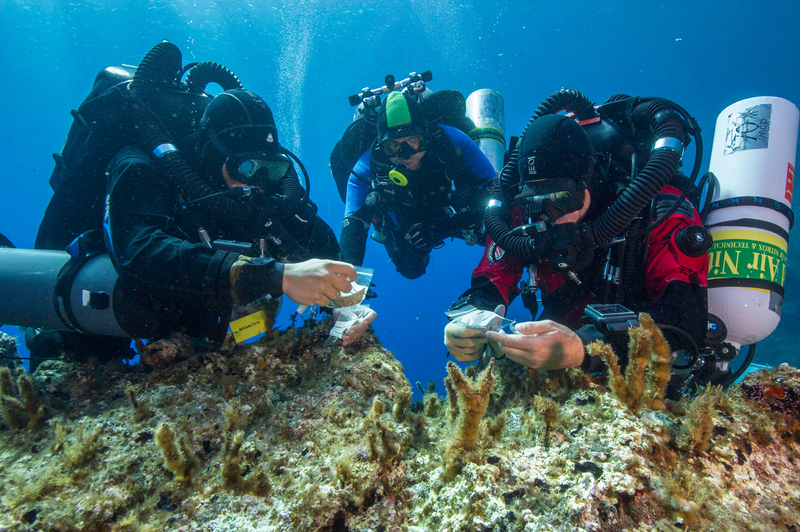 Antikythera team members Nikolas Giannoulakis, Theotokis Theodoulou, and Brendan Foley inspect small finds from the shipwreck, while decompressing after a dive of 165 feet beneath the surface of the Mediterranean Sea in Greece. "Of the 40 or 50 shipwrecks all around the Mediterranean, "there's nothing like the Antikythera," says Brendan Foley, an archaeologist from the Woods Hole Oceanographic Institution. He's only recently returned from exploring the ruined ship, which now sits nearly 200 feet beneath the surface, encrusted with sediment and sea life. 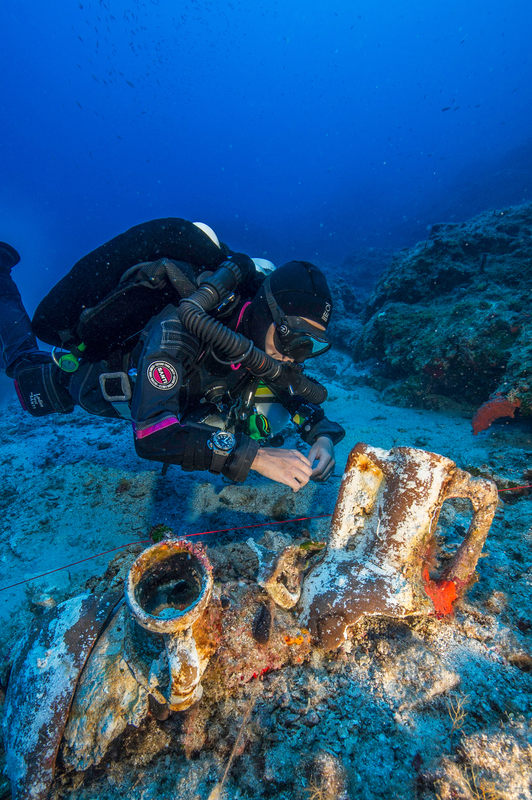 Professional technical diver Gemma Smith studies artifacts on the Antikythera shipwreck. In 1900, marble and bronze statues brought up by the sponge divers who discovered the ship stunned the world. Even more amazing was the Antikythera mechanism, a mysterious metal device the size of a wall clock. It turned out to be a sort of clockwork computer that predicted planetary movements and seasons with remarkable accuracy. The wreckage drew no further exploration until 1976, when divers outfitted with scuba gear could search more carefully. It was full of the best stuff available in the first century B.C., Foley says, including gold jewelry, glassware, perfume bottles and medicine bottles — a floating bazaar of wealth from the early Roman Empire. 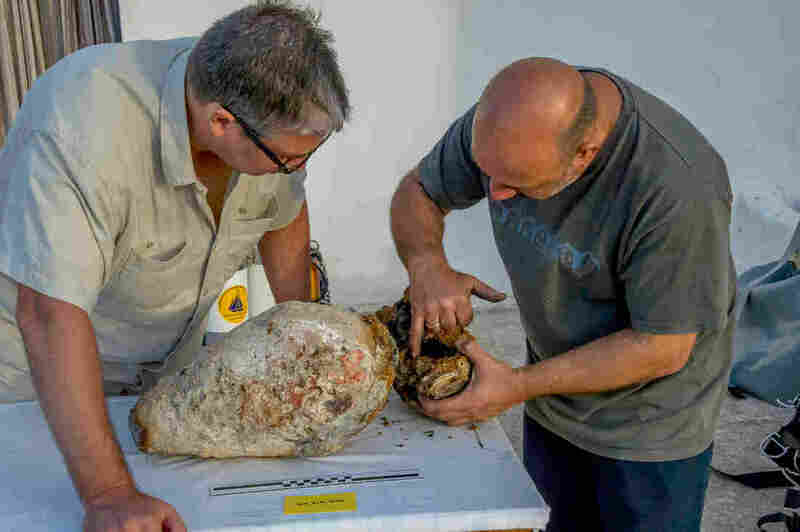 In 2012, the Greek government asked Foley and his colleagues to help Greek scientists search for more artifacts. The Woods Hole team brought underwater robots and sophisticated diving gear so they could dive deeper and longer. They mapped the entire site. And they found more stuff. The ship was massive — about 180 feet long with hull timbers 5 inches thick. That's as thick as those of ships built centuries later, during the American Revolution. Analysis by Foley's team suggests the ship was likely built in Greece. He says it probably sailed in the service of Rome, which ruled the region at the time. It may have traded grain and luxury goods between the capitol and far-flung parts of its empire. Project co-directors Brendan Foley and Theotokis Theodoulou inspect the torpedo-shaped lead cylinder recovered from the Antikythera shipwreck. Recently the scientists found something in the sediment that was definitely not a luxury item. At first, they thought the torpedo-shaped cylinder was ceramic. "But then we tried to move it," Foley says, "and it was unbelievably heavy." The cylinder was made of lead, and had a hole through it. No one knew what it was. To find clues, Foley went back to ancient literature — writings by the Greek historian Thucydides. "He writes how the biggest ships in antiquity had these defensive armaments known as dolphins," Foley says. Today's archaeologists suspect that when an enemy ship pulled alongside to board, sailors would hoist the dolphin up to their own yardarm, and then drop it on the enemy ship to put a hole in its hull. "It would have been truly a wrecking ball," Foley says, "and it's the only one in existence if that's what it is." The team plans to return in September to the site — where another wreck they've found nearby awaits exploration.